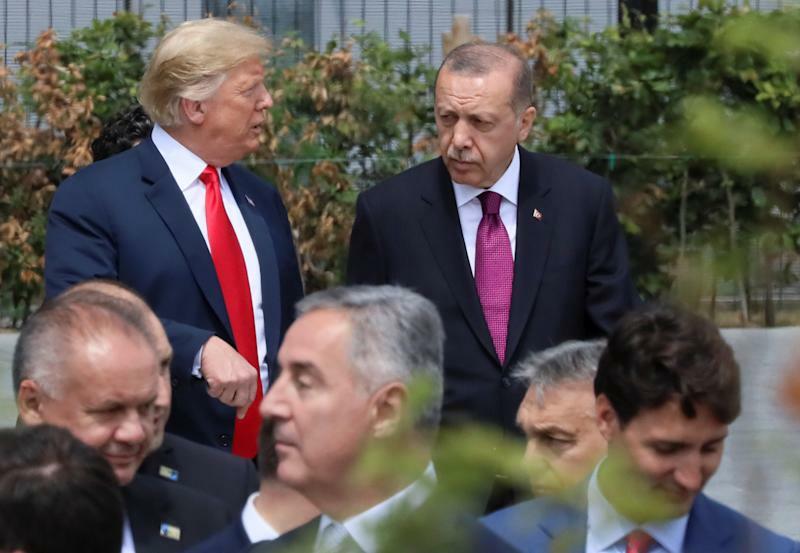 NATO Alliance Summit in Brussels U.S. President Donald Trump, Turkish President Tayyip Erdogan and Canada’s Prime Minister Justin Trudeau are seen at the start of the NATO summit in Brussels, Belgium July 11, 2018. REUTERS/Reinhard Krause By Behiye Selin Taner and Lisa Lambert ISTANBUL/WASHINGTON (Reuters) – President Tayyip Erdogan told Turks on Friday to sell their gold and dollars to support the crumbling lira, which was in free fall as U.S. President Donald Trump escalated a feud with NATO ally Turkey by doubling tariffs on metals imports.The lira has long been falling on worries about Erdogan’s influence over monetary policy and worsening relations with the United States. That turned into a rout on Friday. 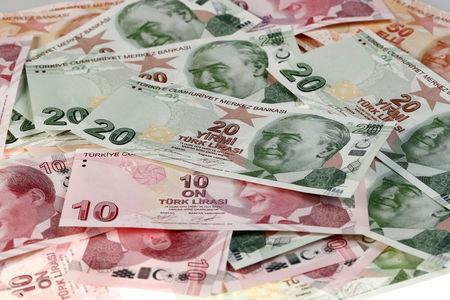 The currency dropped as much as 18 percent at one point, the biggest one-day fall since a 2001 financial crisis in Turkey.Reverberations spread through global markets, with European stock markets especially hit as investors took fright over banks’ exposure to Turkey. U.S. stocks were also rattled. 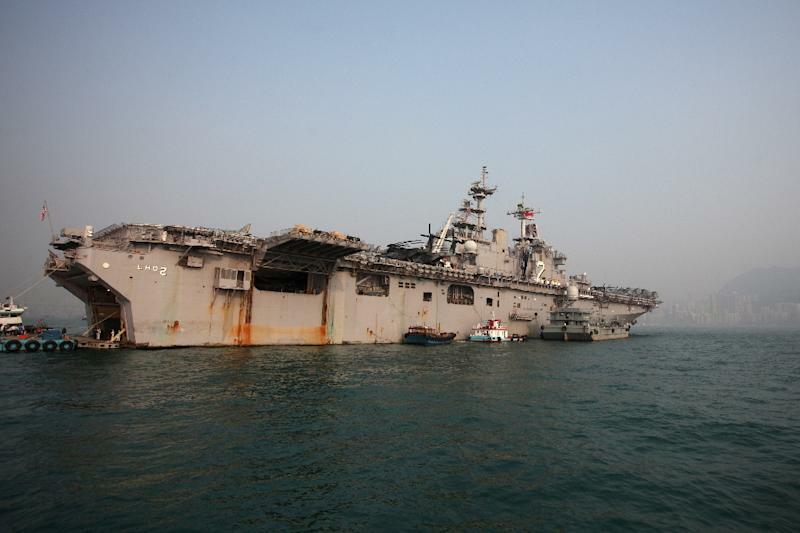 Manila (AFP) – The US military said it had launched a search and rescue operation after reports a marine may have fallen overboard from an American warship as it sailed through Philippine waters.The US 13th Marine Expeditionary Unit said a member, who was not named, may have gone overboard Thursday morning.Aircraft on board the USS Essex are searching waters off the Sulu Sea and the Surigao Strait while multiple searches are also being made inside the ship itself, the unit said.The ship was conducting „routine operations in the Sulu Sea” at the time, the California based unit said in the statement, which was posted on its social media sites.”We remain committed to searching for and finding our marine,” the statement quoted its commander, Colonel Chandler Nelms as saying.”All of our sailors, marines and available assets aboard the USS Essex have been and will continue to be involved in this incredibly important search and rescue operation,” added the search commander, US Navy Captain Gerald Olin.In Manila, Philippine authorities said on Saturday they authorised US ships and aircraft to enter Philippine territory to join in the search, while dispatching their own military search aircraft.”A US marine fell from a US ship while traversing Philippine waters. We allowed the entry of rescue ships and aircraft,” Defence Secretary Delfin Lorenzana told reporters.”As of now there has been no update on whether the marine has been recovered,” Lorenzana added.The US Marines said an expanded search covering about 3,000 square nautical miles (10,290 square kilometres) was underway.Sulu Sea sprawls over the central and southern sections of the Asian archipelago, a US military ally.Surigao Strait is at least 300 kilometres (186 miles) away, off the country’s eastern seaboard.